In American history, the battles of Lexington and Concord are important being the first battles of the American Revolutionary War. These battles, which took place on April 19, 1775, marked the outbreak of armed conflict between Great Britain and 13 of its colonies in British America. Same day, 86 years later, the first bloodshed of the American Civil War occurred, courtesy the Baltimore riot of 1861. According to Wikipedia, thirty three years after the Baltimore riot, in 1894, Frederic T. Greenhalge, the 38th governor of Massachusetts, proclaimed April 19 as Patriots’ Day to commemorate the battles of Lexington and Concord. Roughly two years since the practice of Patriots’ Day commenced in Massachusetts, the first modern Olympic Games were held over April 6-15 at Athens, Greece in 1896. The manager of the inaugural US Olympic team was John Graham, who was also a member of the Boston Athletic Association (BAA), founded in 1887. Inspired by the Olympic marathon, he, with the assistance of businessman Herbert H. Holton, moved to establish a similar race in Boston. One of the sub-stories in the larger narrative of the battles of Lexington and Concord is that of Paul Revere, a prominent and prosperous Boston silversmith who helped organize an intelligence and alarm system to monitor the British military. A prominent episode therein is Revere’s `Midnight Run.’ On the night of April 18, 1775, Dr Joseph Warren told Revere and William Dawes of British troops about to embark on boats from Boston for Cambridge and the road to Lexington and Concord. Revere rode out that night warning patriots along his route of the impending British move. In his book on the Boston Marathon, Tom Derderian (excerpts from the book are available on the Internet) has noted that Graham and Holton considered Revere’s route for the marathon. The problem was it wasn’t just Revere who rode out to warn patriots that night in 1775. There were others, including those he tipped off, who helped courier the warning. Further, the layout of roads had changed in the intervening years, the exact routes the patriot-couriers rode wasn’t known in detail and many of the routes weren’t long enough to satisfy the needs of a marathon. However the rail road west led to Ashland station and ran parallel to a road back to Boston. This, Derderian writes, was a logical choice and thus became the route of the marathon. In his book, American Sports: A History of Icons, Idols and Ideas (excerpts available on the Internet), Murry R. Nelson says that the marathon’s original course ran from Metcalf’s Mill in Ashland to Irvington Oval in Boston. The biggest celebration of Patriots’ Day has remained the Boston Marathon (according to Murry R. Nelson, it was initially called the American Marathon), which has been run every Patriots’ Day since April 19, 1897. An exception was if April 19 turned out to be a Sunday. Then, the race was run the following day, a Monday. 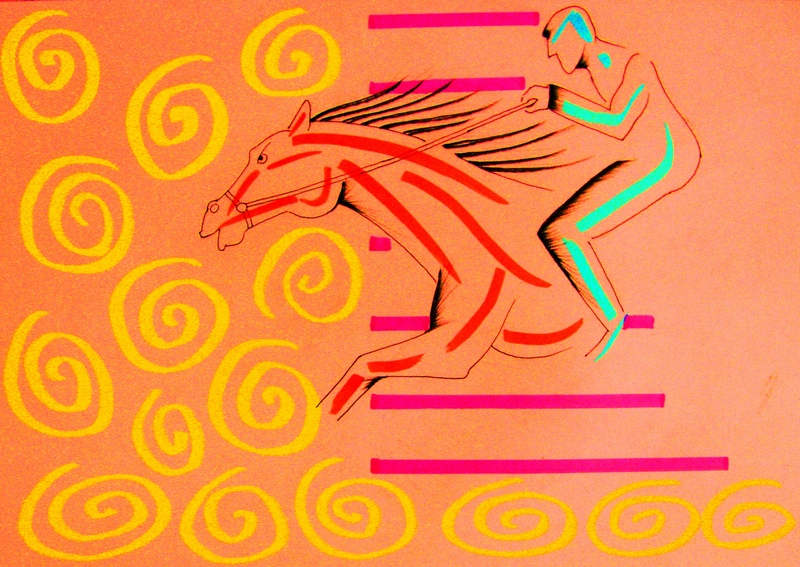 Since 1969, the race has been held on a Monday. In the first Boston Marathon of 1897, John J. McDermott of New York triumphed, winning the race in 2:55:10. Among the longest running presence at the Boston Marathon was that of John A. “ The Elder’’ Kelley, who ran his first race in 1928 and the last in 1992. His name is bound up with the incident from the 1936 edition of the race, when he passed the leader Ellison “ Tarzan’’ Brown on one of the last of the Newton hills, only to lose to Brown in the end. Writing on that race, Boston Globe writer Jerry Nason coined the still-used phrase: ` Heartbreak Hill,’ Murry R. Nelson says. I am very, very happy with my Boston performance. I got a personal best of 04:16:13, cutting off seven minutes from my previous best timing. I had planned my race in three stages: 1-26 km (pace 5.55-6.00/Km), 27-34 km (pace 6.15-6.20/km) and remaining 8 km on best effort basis. My expected time of finish was 04:17:40. The weather in the first 26 km was very hot. The sun hit directly as the race started at 11.15 AM. This portion had a lot of downhill with some uphill. Everyone had cautioned not to go too fast as there are four big hills to deal with after those 26 km. I started off fast but then settled down at 5.51-5.53/km, going down a bit fast and slowing on the ups. At 27 km I started cramping badly in the calf and hamstring. I had to stop at least 5-6 times to stretch and start slowly. The final pace from 27-34 km became slow – 6.30/km. During the 34 km stage I stopped at every single water station as it was hot and my mouth was absolutely dry. I wasted a lot of time. But the good thing was, I had no idea when I got over the four hills, especially the much talked about ‘Heartbreak Hill’ as my full attention was on the cramps and thirst. 35-42 km was really good. I regained my rhythm and the cramps stopped as I had a lot of salt. Got a pace of 6.00/km and finished very strong. I have always enjoyed the hills. This was a perfect setting for me. The cheering was really, really good. Not a dull moment through the 42.2 km. All arrangements were just perfect; starting from the bus pick-up at Bolyston, the refreshments at the starting point, the toilet facilities (so many that one did not have to wait in queue), the miles and kilometer markers and finally the finish. It was a super experience. Before I left for the US, there was a big hype about my doing the Boston marathon. But, I did not feel so. I thought it was another 42 km race. I was hyper about the trip, the planning of warm clothes, the race day attire, the stay and the shopping and that I would have to travel alone in the bus to the starting point and run alone. That I was to run the prestigious Boston race was secondary. I slept well the night before the race. The memorable moment was when I took the first step at the starting point. I was filled with emotion and tears rolled down. 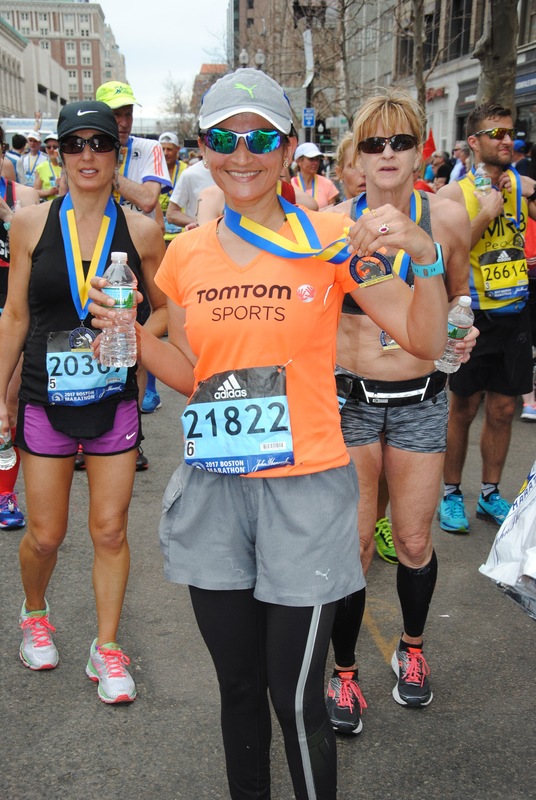 That was the time it dawned on me that I was running `The Boston Marathon.’ I was very happy and felt strong. 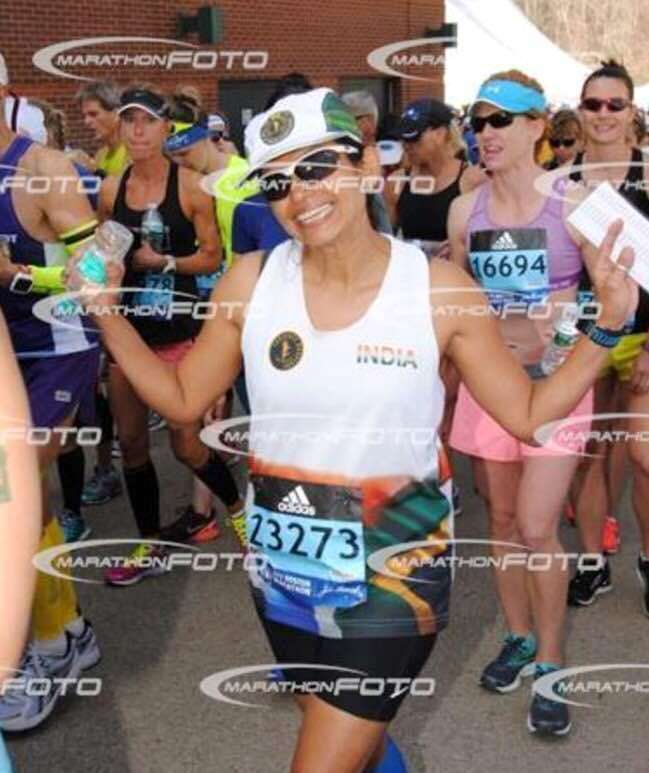 My training for Boston started a week after the Mumbai Marathon. My trainer Sandeep advised me to go to my physio and check out if I needed any help. Mondays and Fridays were rest days, Saturdays, Sundays featured back to back runs and Wednesdays saw speed runs plus hills. Even the Sunday long runs were easy, with speed in the last few kilometers. Every Monday I got a deep-tissue massage. My colleagues helped me a lot during my training. On every run I had at least 4-5 friends giving me company. On Sunday long runs, they would plan and join me at different points so that I would never run alone. My training was perfect. I am sure I would not have wanted to do my training any differently. I divide the race into two halves of 21 km each. The first half was fairly good. I was well within my pace. 27 km onward the race started unraveling for me. I really can’t pinpoint what went wrong; I was sapped of energy and couldn’t push myself to maintain my pace and my quads starting hurting. What hurts me most is that in the last 5 km my mind also gave up on me. I felt like walking…just finishing the race. For the last 2 km I took 16 minutes….my quads were painful and mentally I was tired. I could not conquer the hills; I feel the hills got the better of me. I have run the Berlin Marathon. That was a flat course and the weather wasn’t this hot. Berlin I was in control of the race till 36 km and marginally slowed down post 36 km. The crowd at Boston is amazing. The cheering at both places was awesome and different. There were more people on the roads at Boston whereas there were more bands and more music on the Berlin track. The organization at Boston was flawless. The runners at both the events were fast and superbly fit. 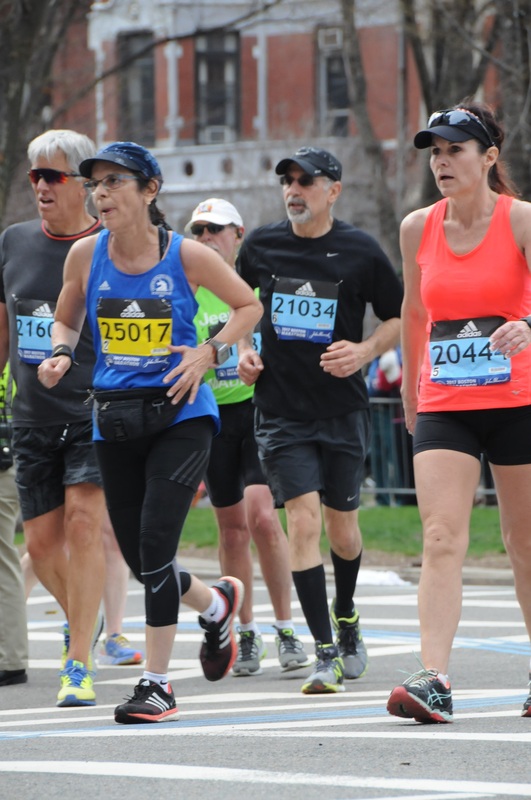 Would I want to attempt Boston again to improve my performance? I think I would like to realize my wish of completing the six world majors first. In 2011, my son Chirag joined athletics training at PDP (Priyadarshini Park). I used to walk around till his training got over. That didn’t satisfy me. Looking at the tracks, I remembered my school days when I was a national level track athlete. I asked the coach whether I could join. He asked for which event. The Mumbai Marathon registrations were going on then. So I said, “ marathon!’’ I started training and registered for my first half marathon. I also attended the Nike Running Club (NRC) training session on Sundays at Marine Drive, that year. My first half marathon at the 2012 Standard Chartered Mumbai Marathon (SCMM) was a unique experience. For rookies, the starting position was way behind. I had to zip and weave through the crowd for the first 10 km. At the finish line I wasn’t tired and didn’t get the runner’s high. I decided to do the full marathon at that moment. Next year, 2013, I ran a full and to my surprise won a podium finish in my category. Every year since then I’ve been running the full marathon at SCMM and it has been either a podium finish (among the top three positions) or a PB (Personal Best). I’m happy with my performance at Boston because the timing – I completed the race in 3:51 – is another BQ (Boston Qualifier). Yet I feel I could have done much better if I wasn’t having an upset digestive system. I was in self-doubt at the start line, whether I would complete the race or not. I couldn’t eat or digest the food that’s necessary for race week. I would divide this race into three sections- the first seven kilometers, the next 23 km and the last 12.2 km. The race has variable gradient throughout the route. However, these three sections are important for watching your pace. The first downhill makes you start very fast with fresh legs and race spirit. If you can control your pace and relax during this first section, you can use your energy in the last one. The middle 23 km are somewhat steady and can be maintained at a steady pace. The uphill made me slow but I saved time while going downhill. I let gravity take me down every hill I passed after this section. One has to experience Boston to believe it. I have no words to talk about the cheering! Thousands of people, families and kids coming out of their houses and pouring their heart out to cheer the runners; the Wellesley College girls and boys with their kisses near Heartbreak Hill…you don’t even realize when you passed that hill! I had many memorable instances from the race. I heard people cheering me by my name: “ great going Kranti” or “ hey TomTomSports,’’ hundreds of times on the route when I was just flowing with the river of runners. 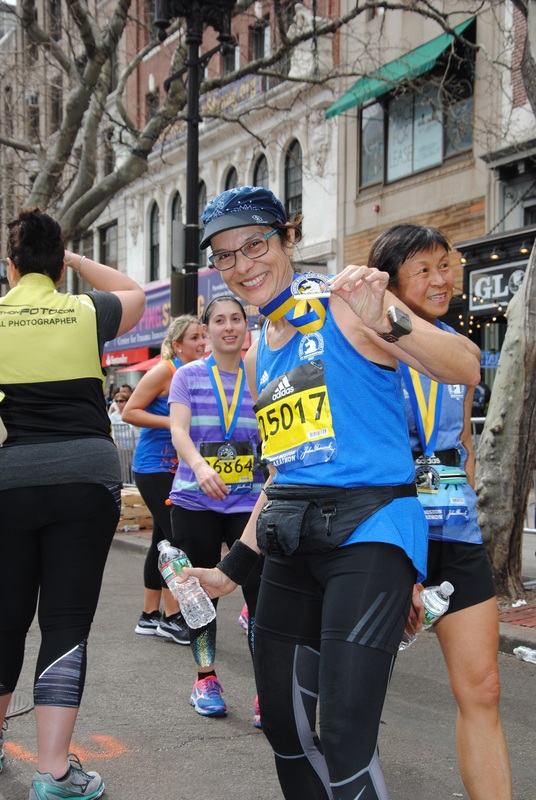 Getting special attention in a race like the Boston Marathon was so empowering! In Mumbai, I train on the tracks at PDP. My long runs on the road are limited due to lack of sufficient time in the mornings. So, I enroll myself for the races which fit into my training schedule. That way I get the benefit of race pace-runs, which I doubt I’d be able to do otherwise on busy Mumbai roads. A guaranteed podium finish is a bonus 🙂 I train all through the year as I go to PDP with my son for his athletics. There wasn’t any particular plan for the Boston Marathon. 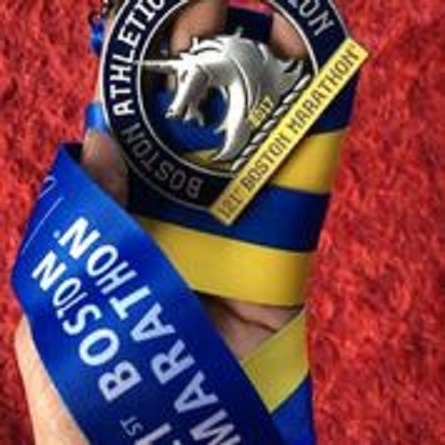 I had read about the hills, and the unique route of Boston Marathon. However, I couldn’t give much time for hill training. I just did two long runs in the neighborhood of Malabar Hill where I live. I didn’t do any 20 miler runs even for this race. May be it’s the time limit; I have to stop my run and go back home to prepare breakfast for the family. On my long run day, I do whatever distance I can for three hours. It goes to even 28 km on a hot humid day. I feel I can achieve better timing in any marathon if I do a couple of long runs. The body does not understand a route, whether its hills or flat; it understands the effort and the strength required. To be prepared for the challenges of race day, I would focus more on strength and endurance.